China is among the most ethnically homogeneous large countries in the world, with Han Chinese accounting for 91 percent of its population. The ruling Communist Party considers China’s homogeneity and social cohesion to be pillars of its strength (and, also, potent rationalizations for discrimination against ethnic minorities and authoritarian rule). But the territory of Xinjiang, in northwest China, is home to a large population of Uighurs, a predominantly Muslim, Turkic ethnic group. 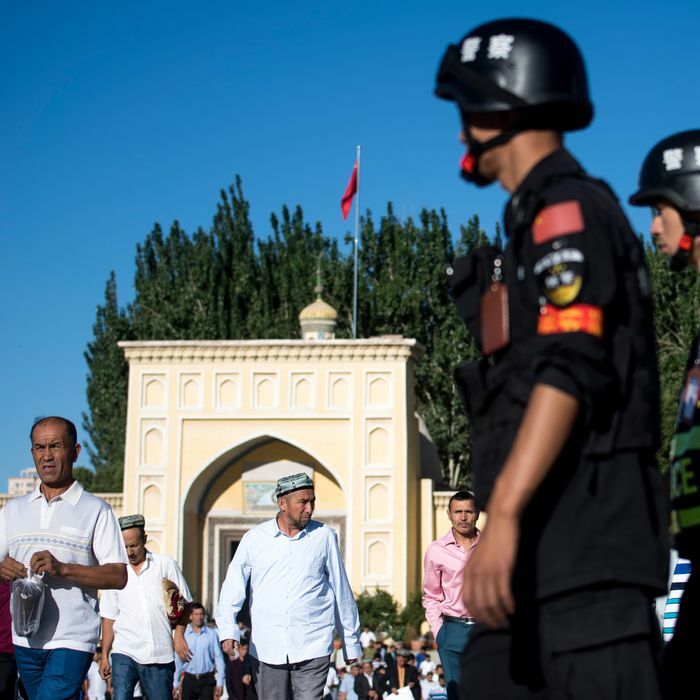 The Chinese government has long worried that the Uighurs will attempt to establish an independent homeland in the region, which they commonly call East Turkestan. In 2009, ethnic riots in Xinjiang claimed hundreds of lives; since then, individual Uighur nationalists have carried out multiple terrorist attacks. So, to combat the impression that Uighurs have any cause for wanting their own separate state — let alone for deploying violence to achieve it — Xi Jinping’s government has decided to declare Islam a contagious “ideological illness,” and quarantine 1 million Uighurs in reeducation camps, according to an estimate from the United Nations. In interviews, former inmates from these camps say that they were made to renounce their faith, sing Communist Party songs, consume pork, and drink alcohol; other reports suggest some of the truly “ideologically sick” have been tortured and killed. At first, Beijing was content to reserve its concentration camps for suspected radicals. But, as the Atlantic’s Sigal Samuel explains, they eventually decided that the Uighurs’ ideological malady was so destructive and contagious, it was best to quarantine them prophylactically, upon the slightest apparent symptom (like, say, the appearance of a long beard on an Uighur male’s face). Members of the public who have been chosen for reeducation have been infected by an ideological illness. They have been infected with religious extremism and violent terrorist ideology, and therefore they must seek treatment from a hospital as an inpatient. … There is always a risk that the illness will manifest itself at any moment, which would cause serious harm to the public. That is why they must be admitted to a reeducation hospital in time to treat and cleanse the virus from their brain and restore their normal mind … Being infected by religious extremism and violent terrorist ideology and not seeking treatment is like being infected by a disease that has not been treated in time, or like taking toxic drugs … There is no guarantee that it will not trigger and affect you in the future. Having gone through reeducation and recovered from the ideological disease doesn’t mean that one is permanently cured … So, after completing the reeducation process in the hospital and returning home … they must remain vigilant, empower themselves with the correct knowledge, strengthen their ideological studies, and actively attend various public activities to bolster their immune system. Clearly, this is the missive a political party with a supremely healthy ideology. To this point, international outcry over China’s mass repression of its Muslim population has been relatively tame. As Business Insider notes, the governments of many Muslim-majority countries have declined to express public opposition, for fear of jeopardizing their access to Chinese capital — especially the infrastructure loans that Beijing has provided as part of its “One Belt, One Road” initiative. Fortunately, the United States remains, for now, the world’s preeminent military and economic power. And as president Trump made clear in his speech withdrawing the U.S. from the Iran nuclear agreement, our country is deeply committed to spreading religious freedom, individual liberty, and other human rights throughout the globe. So, is there any reason to doubt that Trump will make the liberation of the Uighurs America’s top priority in its next round of negotiations with China over trade policy?